Swordfish are harvested via harpoon from boats (either rowed or powered) called "stick" boats. "Dart" or small harpoon heads are affixed to a shaft and then the harpooner's skill would determine whether or not the trip was successful. This method is still used today... many times in concert with a spotter plane. This plaque has two actual bronze "darts" used for sword, Giant Blue Fin tuna, or sharks. When a swordfish is caught the "bill" is saved, soaked, cleaned and dried (the process takes years if done correctly) for use for scrimshaw, burning, or painting. 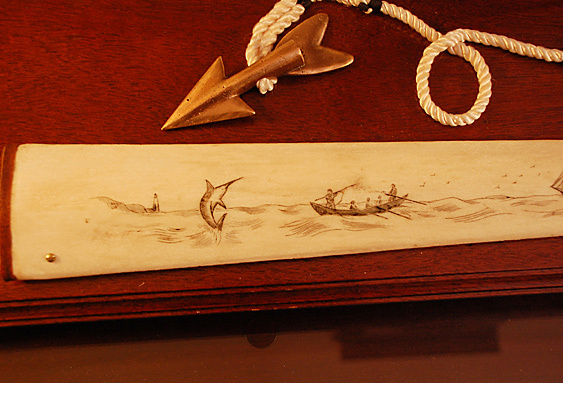 This vintage "bill" depicts a swordfish hunt by early fisherman. The quality of the work indicates a non-professional scrimshander... probably the fisherman who harpooned the fish. It is signed (“E.M.C.”) and dated 1952. The items were mounted on a custom solid mahogany board that was sealed with four coats of hand-rubbed spar varnish. The plaque is 38” Long and 8 ½” high. Solid brass mounting hardware is included.